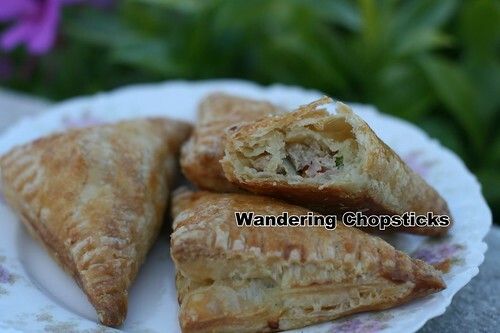 I'm not sure why I haven't posted a recipe for Banh Pa Te So (Vietnamese Pate Chaud (French Hot Pastry Pie)) before. Perhaps I was overthinking it and wanted to wait until I tried my hand at making puff pastry. Or maybe I veered the other direction and thought it was so basic that it didn't need a recipe. I admit, I don't often make a filling specifically for banh pa te so. Rather, if I'm making Cha Gio (Vietnamese Egg Rolls), I use the leftover filling to stuff them or any other leftover filling or meat. My mom buys frozen puff pastry in bulk and cuts them into squares and brings them down to me. So I almost always have some on hand. They make a great light breakfast or quick snack. But, since one of my readers requested, and in case you wanted to specifically make banh pa te so, here's my recipe. 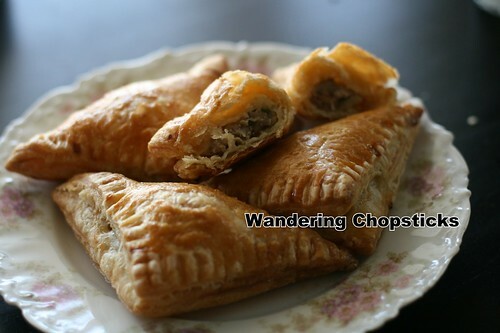 By the way, I always knew that banh pa te so is the Vietnamese phonetic equivalent of pate chaud (French hot pastry pie), but according to Wikipedia, apparently it's an outdated 19th century term. Blame it on colonialism. Learn something new every day! With my love for pot pies, well, really, any savory filling in pastry, it's a wonder I haven't posted about this before. 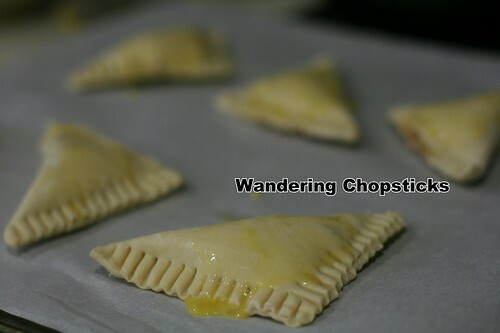 Make sure your puff pastry sheets are defrosted and ready to fold. Cut them to desired size. Set aside. Soak about 6 shiitake mushrooms in hot water to soften. 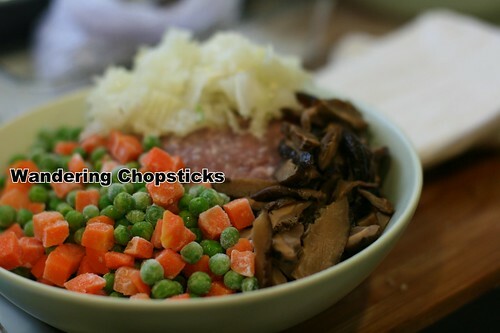 Remove the stems and thinly slice the shiitake mushrooms. 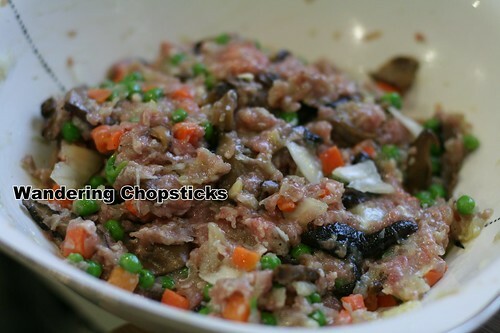 In a bowl, add 1 pound ground pork, grated onion, minced garlic, sliced mushrooms, 1 cup frozen peas and carrots, 1 egg, 2 tsp fish sauce, 1/2 tsp salt, and 1 tsp ground black pepper. Mix thoroughly. You can take a small amount and cook it in the microwave for about 30 seconds and test for flavor. Adjust seasonings accordingly. 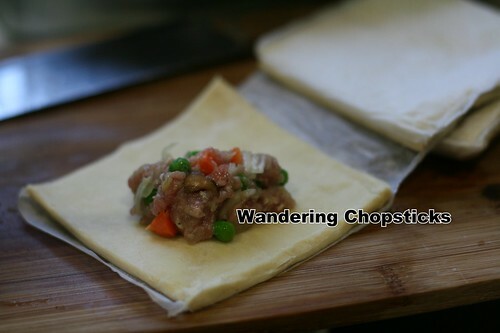 Place a spoonful of the filling in the middle of the puff pastry sheets. 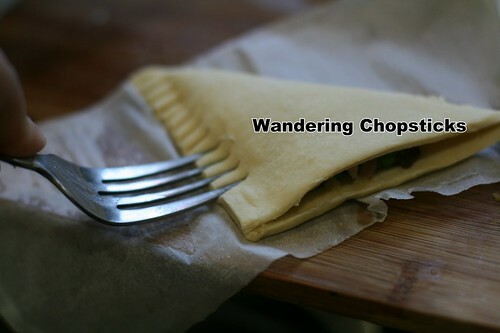 Fold over and crimp the edges with the tines of a fork. I like to make triangles, but the niece likes to make rectangles. 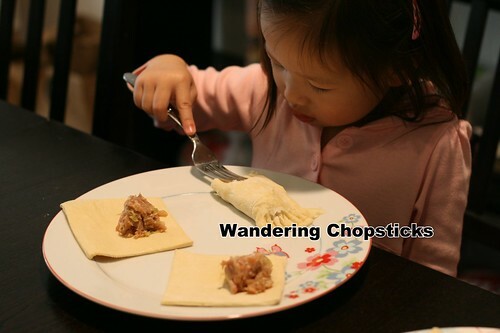 Last month, I let her make banh pa te so with leftover wonton filling. I love how she's so focused on her task. Beat the remaining egg and brush on top of each puff pastry. 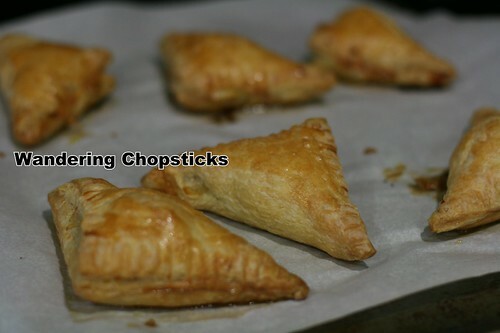 Bake at 350 degrees for about 30 to 35 minutes or until puff pastry is golden. They're hot! Try not to burn yourselves if you can't resist biting into them straight away. Here's a close-up with the filling so you can see. Store the filling in a tight container and it should keep for several days. 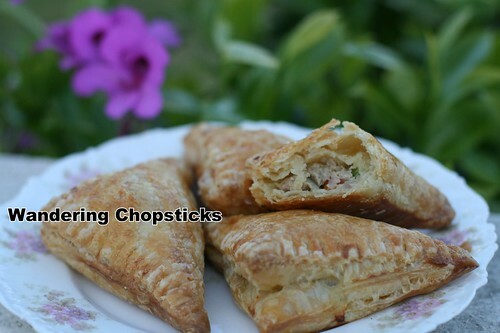 Since the puff pastry is already cut up for me, I usually only make however many I plan to serve at once. 3 years ago today, How to Eat Hot Vit Lon (Vietnamese Fetal Duck Eggs). 4 years ago today, Bhan Kanom Thai - Los Angeles (Thai Town). 5 years ago today, Dith Pran and the Killing Fields memorial in Siem Reap, Cambodia. 6 years ago today, Tea Station - Alhambra. Will definitely have to try this recipe out, and when I do I'll let you know! I used to love getting pate chaud (chauds? I took French in high school and pluralizing like that looks so wrong!) from my favorite banh mi place, (one of the restaurants I miss the most, having moved to the UK). Your filling seems much more healthy than theirs, since it has actual veggies in it; I recall just having what seemed to be a giant ball of pork wrapped in puff pastry! I think she's pretty adorable, but I'm admittedly biased. :) I just set up the filling and let her fold her own wontons or pastry or whatever. I don't care about aesthetics as much as just letting her have fun. Plus, she's just so darned cute that I love watching her work. She likes to pose with her creations afterward for me to photograph too. Yeah, some versions look like they just sliced a big sausage roll and stuffed it. 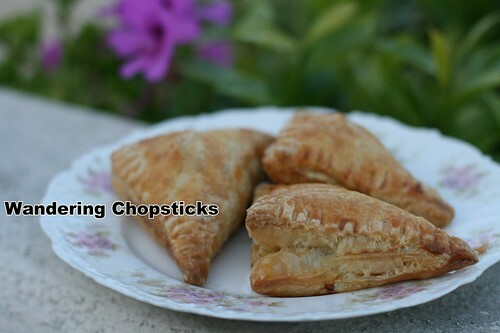 My mom used to make these in the little puff pastry cups with the lids? I haven't seen those for a while though. This is the quickie folding method. Looking forward to hearing when you try it! Oh my god, this is AMAZING. Thank you SO much for this recipe. I grew up in Little Saigon and I had to move for college into a town with very little Vietnamese food (what was available was very pricey). With this, I feel almost like I'm at home! Also, I didn't realize that doing a half batch of this would require more than 1 pastry sheet, which was all I had, so I ended up rolling them out and making 6 mega-sized pate chaud.... oops. Still delicious, either way! Glad you liked it! I remember those college days when Vietnamese food was hard to come by. You can always freeze the extra filling for when you have a craving. That's what I do. 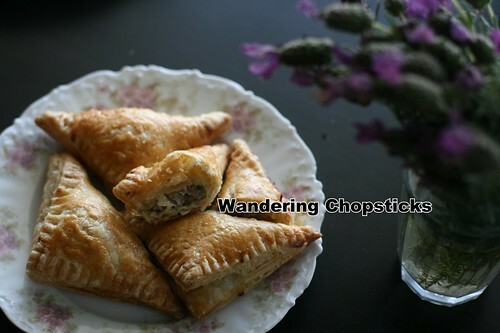 Sometimes I make the full batch of filling, but then divide it into sandwich bags so when I want a few egg rolls or pate chaud or whatever, I can make a few right away without all that prep work. Thanks! I hope you liked the recipe. No pate in your ingredients? No. I don't think it's good reheated and not everyone likes pate. But you can add it to the recipe if you like it!